After an hour’s walk (yes, we are walking again!) from Burch and Purchese in South Yarra, our tummies were making a familiar rambling sound again. It’s time for….MORE FOOD!! 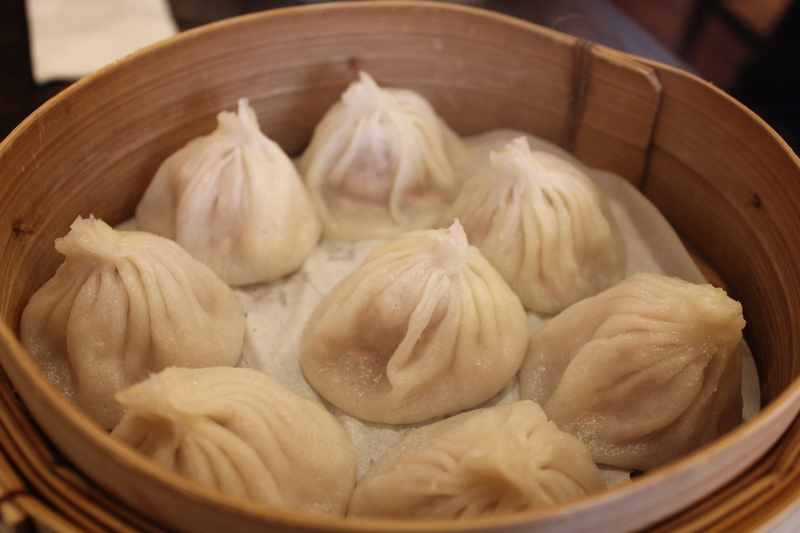 We came to our decisions quickly based on a recommendation from a friend and from hearing many good reviews, we decided to head back to Little Bourke Street in Melbourne city to enjoy some Shanghai Dumplings or Xiao Long Bao at Shanghai Street Dumplings. We arrived at Shanghai Street Dumplings 20 minutes early before it opens so we decided to spend that 20 minutes window shopping at the massive H&M store which is only down the street. After our mini-shopping trip, it was time for some dumplings and we were lucky to find a table to ourselves easily as we were there early when the restaurant was opened. To share, we had the Dumpling in hot and sour soup ($9.50 for 10 pcs). 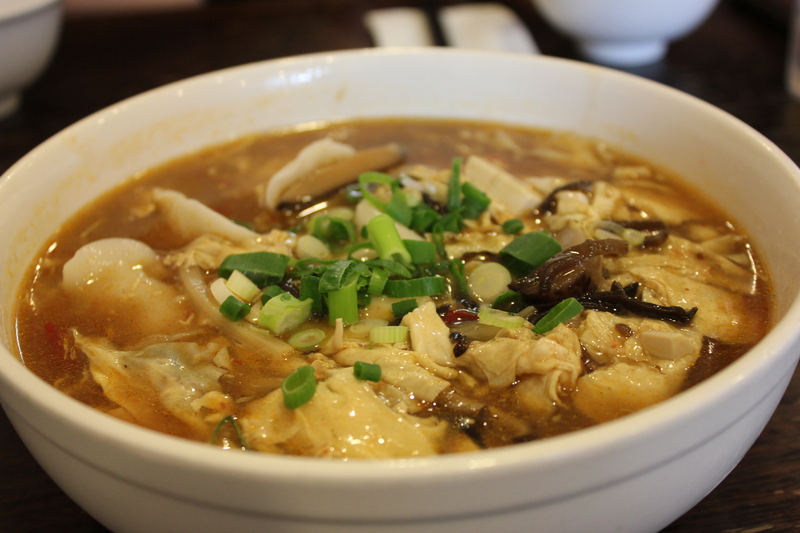 The hot and sour soup was rich and slightly thick in consistency. As we were there on a cold evening, it made such a great dish keeping our bellies warm and contented. The dumplings which were floating in the sea of hot and sour soup were delicious with a good amount of filling. Next up was the homemade traditional steamed pork xiao long bao ($9.80). They arrived super hot and the xiao long bao was fresh, juicy and bursting with flavour. One bite and it was an explosion of flavours in your mouth. Just be careful not to burn your tongue! I’ll also admit that eating xiao long bao is a skill, which some of you might agree. So far, we were successful and none of us ended up having any breakage or leakage from our xiao long bao. We really enjoyed the xiao long bao at Shanghai Street Dumplings although this was only our starter to our anticipated dinner at Chin Chin later in the evening. The food is not only delicious but it’s kind on the pockets too. Not long after we arrived, the tables were fully occupied and when we left, the restaurant was so busy that I can see how popular Shanghai Street Dumplings is. A hidden gem? Definitely not anymore but it’s definitely a winner on Little Bourke Street. YUM! My brother and I walked like you guys! We walked all the way up Chapel St from St Kilda to B&P =P Omgoodness, I got lost in H&M when I went recently! It’s massive! Glad to hear that we are not the only ones walking a lot 😛 How good were the cakes at B&P! I was so tempted to buy one of them and bring it all the way back to Perth! I have never seen such a huge H&M store before and there were sooooo many people shopping when I was there too! YES!! The cakes there are amazing too, I really like the verrines. It’s probably a good thing they’re all the way in Melb – my “waistline” (or lack thereof) is happy haha. Happy 2015!! I really enjoyed the Xiao Long Bao here too. The skin felt a lot thinner than its peers in town. Damn I miss Melbourne so much! You could easily walk and eat the whole day away there :)!